The negotiators from the United States and Japan would continue their talks on a bilateral trade agreement. 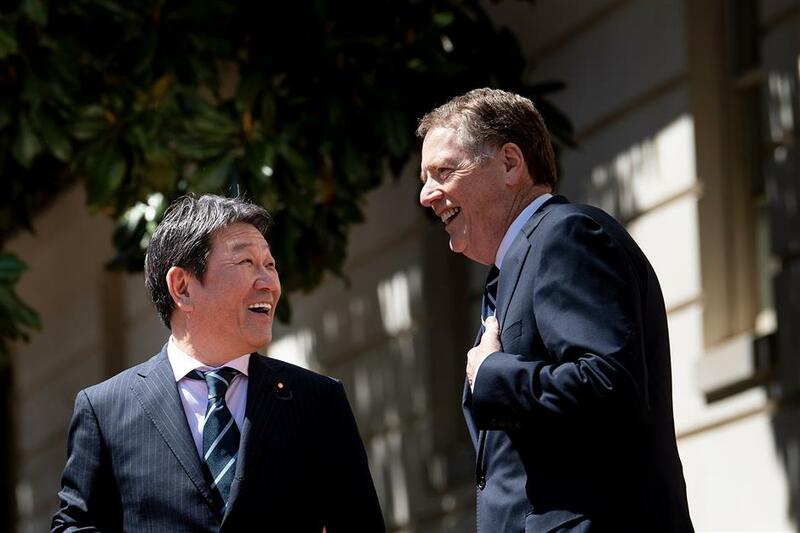 Japan's Minister of Economic Revitalization Toshimitsu Motegi (L) and US Trade Representative Robert Lighthizer talk before a meeting at the US Trade Representative's office on April 16, 2019, in Washington, DC. A statement released by Office of the United States Trade Representative on Tuesday said the negotiators from the United States and Japan would continue their talks on a bilateral trade agreement. According to the statement, US Trade Representative Robert Lighthizer met with Japan's Economic Revitalization Minister Toshimitsu Motegi in Washington on Monday and Tuesday. The two sides reaffirmed "their shared goal of achieving substantive results on trade" in furtherance of the joint statement issued by US President Donald Trump and Japanese Prime Minister Shinzo Abe, it said, adding that the two partners discussed "trade issues involving goods, including agriculture, as well as the need to establish high standards in the area of digital trade." Without mentioning any specific progress in the statement, the USTR said the trade talks would continue and the two countries' negotiators "will meet in the near future." The joint statement issued after the Trump-Abe meeting in September last year underlined that the two countries would "respect positions of the other government." The White House requested more access to Japan's agricultural market in order to benefit its own farmers, while Japan expected to avoid auto tariffs or quotas that could be imposed by the United States.